(February 10, 2019) The Charlotte Douglas Airport is negotiating with the Steele Creek Presbyterian Church to purchase the buildings and adjacent property at 7407 Steele Creek Road just south of Byrum Drive. The church will retain ownership of the historic cemetery. The church has merged with Pleasant Hill Presbyterian Church at 15000 York Road. The merged church is named Steele Creek Presbyterian Church at Pleasant Hill. The congregations of both churches are meeting at the original Steele Creek Presbyterian Church building while the building at Pleasant Hill is being renovated. Beginning April 21st, for Easter Sunday, the new merged church will meet permanently at Pleasant Hill Presbyterian Church's campus at 15000 York Road. The Steele Creek Presbyterian Church was organized in 1760 and celebrated its 250th anniversary in 2010. The first Sanctuary was a small log cabin located in what is the present-day cemetery. 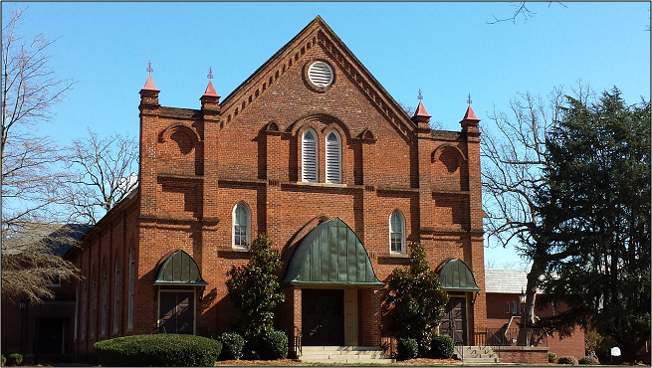 It is the second oldest church in Mecklenburg County and was the largest rural Presbyterian Church in the country during the mid-twentieth century. Five houses of worship have served the congregation. The present Sanctuary was dedicated on April 17, 1889. Both the Sanctuary and Cemetery are recognized on the National Register of Historic Places. During the 1970's the church had over 1,000 members, but most of the nearby residential area has been purchased by the airport or for associated purposes. Membership recently had been reduced to under 300 people. The church has also been significantly affected by airport noise. The planned fourth runway will end only a short distance from the church. The airport will preserve the church sanctuary and adjacent office building for meetings and other community purposes. They plan to renovate the newer buildings for occupation as offices by airport staff. They also will renovate the softball field. Pleasant Hill Presbyterian Church was organized in 1836 and thus has had over 180 years of history serving the Steele Creek community.